Members of the Veterans of Foreign Wars and the American Legion as well as Craig residents salute the American flag at the end of Memorial Day services Monday morning at Craig Cemetery. 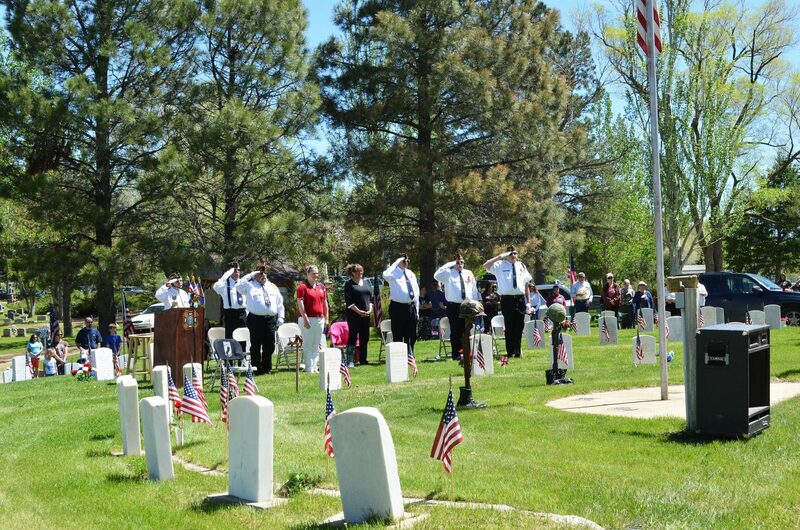 Craig — Moffat County’s residents held their heads low and put hands on their hearts Monday morning at Craig Cemetery in recognition of those who gave the ultimate sacrifice for freedom. Fallen veterans were honored through the Pledge of Allegiance, the reading the names of those who died in combat and by the shooting of rifles into the air. Families held one another, waiting to hear the names of their loved ones called. Moffat County High School students Marie Bolton, 15, and Wesley Atkin, 15, played “Taps” on trumpets to highlight the service of America’s brave men and women. American flags were placed alongside each white marble gravestone where families gathered after the ceremony. Martha Martinez and her loved ones surrounded the gravestone of Eliseo Martinez, her father-in-law. She comes from a long line of family members who served in the military. Martin Beckett, his wife, Isis, and their children Kale, 10, Maia, 7, and Cash, 5, also showed their respect to Eliseo Martinez, who was great-grandfather to the Beckett kids. “It’s a day to remember all of the greats who have given us our freedom,” said Martin Beckett, whose father also served in the military.